There are some new kit available from PEBA made by kymodel, I saw the prototypes in Germany back in October 2018, and they did look nice and well designed. 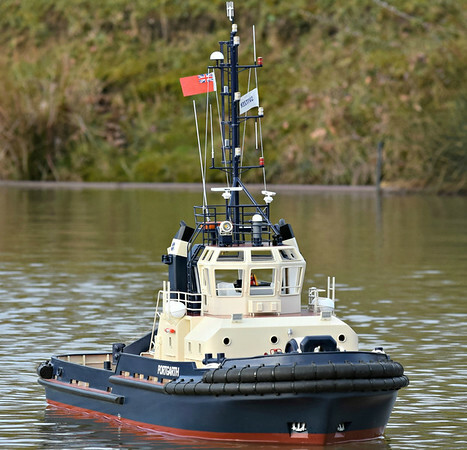 I have just received the MOORING TUG I. The first kits come with some extras, like servo and accessories for it also a motor (speed 400 clone) is included and I'm not sure if this is standard or not. Instruction is in English and is fairly good based on the origin of the kit. The hull is in 3D printed plastic and only require a minor clean-up and a rinse with soap and water to remove the dust from the printing.Access to the hull is good and the removable part of the deck is prepared for magnets, which is included in the kit. Mounting points for the motor and servo is already included in the 3D print.There are some printed fittings include and they are of good quality. The few wood details is also of an acceptable quality and will require some light cleaning and a light sanding. The etched metal fittings look nice and with a fair amount of details. The driveshaft has to be assemble of several parts but looks solid. The Cabin is a single piece and needs to be assembled with window frames and other details, there are also included some brass wire for the cabin "roll cage" and this is the only part of the kit that will take some work and maybe frustration for a newcomer to the hobby. All i all I'm looking fwd to start the build. And the last 4 pics. that looks a nice little project for next winter whilst watching tv, tica, but you don't say what price it is. It's a great little kit and could be a good choice as a farther / son or granddad / grandson project. nice price to...…...cheap considering the hours it will give building and detailing it. Looks like it will make a nice build! Any word of a UK importer / seller for these PEBA kits? Looks like to will make a nice build! now that i like...........350mm if my maths is correct is 13.8".......tiny. I want one! just tried to order one, no paypal, sorry, no deal. a shame as it looks very good. For my part a bank payment ended up costing me the same as using paypal (2,5£) so no problem for me. Just tried to log in. Problem the site does not recognise the codes it gives you. I have tried 3 times and been very careful to get them right, but it just repeats a new code each time. Anyone else had this problem? Is it with the http://www.hobby-lobby-modellbau.com homepage or http://www.peba-hobby.de ? I can access the first but not the other.